Ontario residents pay 13% hst. Canadian residents outside of Ontario pay hst at their own province’s rate, or 5% gst if in a non-participating province. Residents outside of Canada pay no tax. To view a clip of this DVD click the play button above. The above video clip has been reduced in quality for online viewing. The real DVD product has a much higher resolution. This document will make it easier for you to navigate the video. The Table of Contents is already included inside the DVD case, but you can download a copy here if you’ve misplaced it. To read reviews and testimonials about Hendrik’s DVDs, click here. In 2017 Hendrik released two new instructional DVD offerings, bringing the total to 20 titles. “Simple Vacuum Veneering” is the second DVD newly released in 2017, but let us first hear about the long awaited production: “Dowels, Splines and Mitres”. Previous videos have covered machinery and tool skills, working with plywood, wood science and design, staining, finishing and more. They have also covered joinery methods such as mortise and tenon joinery and handcut dovetails. But this time Hendrik shows you a variety of new joinery skills including dowel joinery, splined joints and mitre joints. He demonstrates just how quick and easy dowel joinery can be and how versatile it is for your projects at home. And if you’ve ever struggled to build picture frames or other mitred frames such as table tops, as well as small mitred boxes, this course is going to offer you lots of new ideas. This production includes footage spread over almost 10 hours on 5 disks. As is Hendrik’s usual style, this DVD set is a detailed step-by-step course – not the “usual” DVD fare that may have disappointed you in the past. The DVD starts by reviewing basic dowel joinery technique using nothing more than a drill press and dowel centres. Then, in chapter 2, Hendrik introduces you to a well known dowelling jig called the Dowelmax and shows you just how versatile it is. He shows you how this dowelling jig allows you to make a wide variety of dowel joints quickly and accurately. In chapter 3, Hendrik shows you how to cut accurate mitres for picture frames or similar frame-type assemblies like table tops and cabinet doors. To the average person it would not seem a difficult concept to cut four simple joints that meet at 45 degrees. But the beginner woodworker knows it is far more difficult than meets the eye. Sometimes the simplest sounding tasks can be quite difficult to pull off precisely, so Hendrik walks you through the process and the pitfalls you’ll meet along the way. Chapters 4 and 5 focus on including dowels inside your mitre joints and how to tackle the glue-up. Mitres cannot be glued “as is” as the partial end grain surfaces simply won’t hold up over time with glue alone. So adding a number of dowels inside the joint and gluing it up perfectly will make a project that will last for generations instead of a few months or years. If you’ve always wanted to build small boxes like jewellery boxes, keepsake boxes or even humidors, you’ll need to master another type of mitre joint. Chapter 6 shows you how to cut the mitres super accurately and chapter 7 covers the glue-up itself in real time. Gluing mitres is difficult because the parts start to slip all over the place. But Hendrik keeps perfect control using an ingenious Veritas box clamping jig. Because mitre joints in boxes also do not hold well without further reinforcement, Hendrik shows you two methods to strengthen the joints with splines. He first shows you, in chapter 10, how to insert individual splines (also known as “slipfeathers”) into the corners of a box after they’ve been glued-up with simple mitres. In chapter 8, he shows you how to make the splines yourself from scratch. And chapter 9 shows you how to add splines or slipfeathers to the picture frame type mitres as well. Chapter 11 focuses on how to trim splines with a hand plane after they’ve been inserted and the glue has dried. As usual, Hendrik goes into great detail on how to tackle these final steps using simple block planes. As in all of Hendrik’s DVDs, this production is full of techniques he has been using and perfecting for over two decades. There is always a wonderful mix of theory, with sketches and full explanations, married with real-time demonstrations you can duplicate in your own workshop. This is the beauty of these multiple disk courses, which give you an absolutely enormous level of detail, but in a “live demonstration” format just not possible in a woodworking book or magazine article. The most important aspect of this production, as with all the others, is Hendrik’s full demonstrations done in real time. He doesn’t assume prior knowledge, so even a beginner will be able to follow along the journey. Yet he has a knack for covering the basics while simultaneously delving into super fine points an amateur is unlikely to even consider for many years. The incredibly valuable lesson in all this is that Hendrik never just touches on the basics, but goes deeper, giving you a level of understanding of how to dial in accuracy on that last one one-thousandth of an inch. In fine furniture work, accuracy and detail is everything. Hendrik is known for his detailed “bonus footage” sections in his instructional DVD courses and this DVD is no exception. The bonus footage is called “Other Types of Splines”. Should you wish to join a small box with mitres but without visible splines showing from the outside, Hendrik shows you, in chapter 12, an alternative technique for running one longer spline inside the joint. Chapter 13 focuses on yet another spline method where a “continuous spline” is used to attach thicker trim around the perimeter of 3/4″ plywood. He explains that this technique can be used to build a plywood table or desk top that appears to be 1 1/2″ thick when it is really made with only 3/4″ plywood. This chapter shows you how to use a slot cutter router bit both in a hand-held router and in a router table. Always remember that Hendrik’s productions are not just “entertainment” like a woodworking television show. These are lengthy step-by-step woodworking courses in a DVD format. Like it says on the front cover of these productions, this is “Private Woodworking Instruction in a Box”TM. In short, “Dowels, Splines and Mitres” is the most complete DVD course of its kind on this subject matter. You’ll appreciate the depth of the information and the subtle details fleshed out at every opportunity. As always, Hendrik’s DVD courses are not like the more common 30 to 60 minute productions you may have found disappointing in the past. Hendrik takes you through every procedure in real time, ensuring that you fully understand the thinking behind every step. Most woodworking videos and television shows just show you the “gist” of each technique, editing away the finer details and problems that might arise. If you truly wish to elevate your dowelling and mitre cutting skills to a professional level, the details are everything. Normally, Hendrik can only cover all of the high-level details he loves to teach in person, but he has once again succeeded at giving you personal coaching in a DVD format. As a 5-DVD boxed set running for almost 10 hours, “Dowels, Splines and Mitres” will be the leading instructional woodworking DVD in this area. 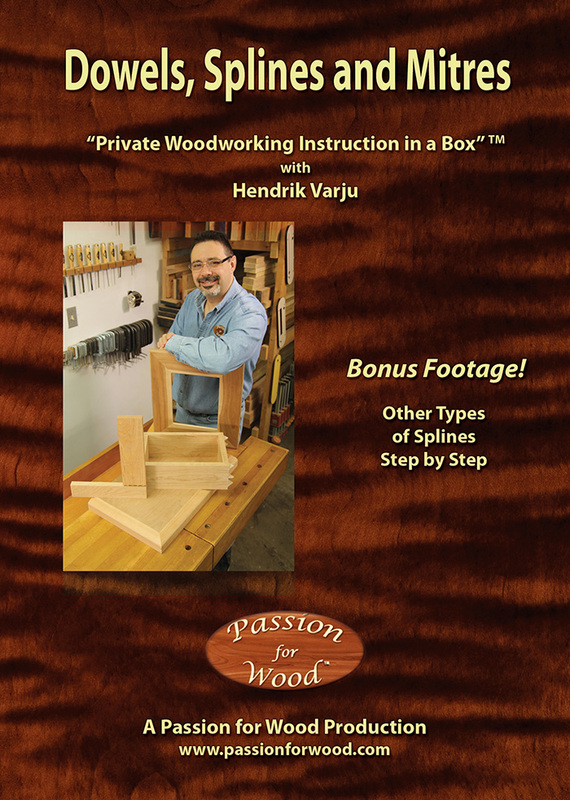 As the trademarked name says, this is “Private Woodworking Instruction in a Box”TM and nothing short of Hendrik’s in-shop seminars and courses even comes close. To order your DVD today, click below.